For many years, when thinking about ornamental fish, I wonder how this paradise of species has not been better recognised and appreciated. This Argentine delta is a unique place, unlike any other similar habitat in the world. It is a beautiful wetland, a magical place with lagoons, jungle, grasslands and floating islands that form in the space of just a few years and are constantly mutating to give birth to new biotopes for different species – this place is so very rich in biodiversity. Firstly, to appreciate the size of this Eden of ornamental fish it is instrumental to know that this river basin is the second largest in the world with an area of 3,200,000 Km². It is one of the greatest attributes of South America with its extremely interesting hydrographic systems, that is even before considering it from an aquarist’s perspective. The Parana Delta is the penultimate phase of this water system which ends in the Rio de la Plata estuary. Before I go on to talk about the Delta, I would like to explain a little about the Parana River, the main protagonist in my focus area. It is the 14th longest river in the world and mobilises a flow of approximately 16000m³ / second. The composition of the river is extremely high in sediment and includes approximately 25% clay sediments, which equates to about 45000 million tonnes per year of which, 15% is sand (25 million tonnes / year) and about 60% is silt (90 million tonnes / year). This large amount of suspended solids mostly comes from the Rio Bermejo and originates in the Bolivian Andes and it is this which has forms the mutating islands over millions of years, even in spite of the interventions made my mankind. The Delta of the Paraná is one of many wetlands which exist in Argentine territory, considering that a wetland is an area which remains under flood conditions, or at least with its substrate saturated in water for a prolonged period of time. Characteristics of such places are hydromorphic soil substrates and both flora and fauna which are adapted the changeable substrates as well as to the greater ever-changing habitat. The Parana Delta is born in the city of Diamante which lies in the Entre Rios Province and this is where the so-called “pre-delta“, the 2548 hectare national park ends, approximately 5km from Diamante and eventually terminates in the estuary at Rio de la Plata. This Delta is divided into three parts, the Superior Delta: from Diamante to Villa Constitución in the province of Santa Fe, the Middle Delta from Villa Constitution to Ibicuy port and finally the Lower Delta from Ibicuy to the mouth of the Rio de la Plata. The length of the Parana Delta is 17500Km². The Parana Delta has extremely diverse wildlife, although sadly there are many species which either no longer occur, or simply occur in very small numbers among the islands, eg. Panthera onca (Jaguar), which gave rise to the name of the party of the province of Buenos Aires, “Tigre” (Tiger), just like the river of the same name. Other examples are, Yacare (Caiman), although these are also now only found in very low numbers here, Puma, Otters, Peccaries, Maned Wolf and the Yellow Anaconda. Most of these creatures are no longer found in the Parana Delta region. With respect to aquatic life, this area is located at a potamic subtropical epicentre of ichthyology with 182 species inhabiting its waters (according to research). Many of the species of the Parana Delta have significant importance within the aquarium hobby, many of which we photographed as part of this article to share with the rest of the world, the beautiful biota that exist within this little-known paradise in Argentina. The climate here is relatively mild, with regular average rainfall of approx 1016 mm throughout the year and an average annual temperature of 17.4°C. The cool season is from mid April and finishes in late August when the warm seasons begins and the average annual temperature is 24.5°C. There is more precipitation in the warm season and it is much drier in the cool season, the large volume of water in the region contributes to the high humidity of 75%, this generates a low thermal amplitude and aids in developing the humid subtropical micro-climate. The waters which originate in the Northern Argentine subtropics, recede in summer with temperatures often sitting at around 25-26°C, but occasionally a little higher as well. San Pedro: The characteristic point of the middle Delta. San Pedro, which is the abbreviated name for “Rincón de San Pedro Dávila de los Arrecifes”. It was originally a small town but was declared a city on 25th July 1907 as a result of its first Port, which enabled growth. It is just north of the province of Buenos Aires along the Rio Parana and north of the mouth of the Río Arrecifes. No small fact is the historically significant fact that within walking distance of the city, la Batalla de la Vuelta de Obligado took place on the Parana River, where Argentina gained independence from Britain and France. Aside from San Pedro being an important part in Argentinian history, it is also important geographically as perhaps the most characteristic area of the middle delta. The worlds suppliers of ornamental fish from Buenos Aires, source their catches from here and today, several iconic species are collected in this area. For several years, we’ve had constant interaction with the Delta, but it was here at San Pedro that we wanted to come to document the habitats and ichthyofauna in high definition. Our aim was to go for a weeekend to document as many species as possible from this area and although on weekend is not always enough time to do this, we hoped to give aquarists a good indication of the species which are most abundant in this biotope. Biotope: San Pedro: We decided to try some different ways of fishing. It is very normal here for people to fish for consumption as well as sport fishing with the catch and release method. We opted for a large netted frame and adjusted the depth according to each biotope as was required; we built the nets at the location using the materials shown. We started making a framed net providing just the right depth to reach right up to the the base of the floating plants, with the classic frame size it is not possible to trap those fish which are very fast and elusive. We always prefer to build the net at the location in order to customise the size for the location. Parameters show relatively soft water with conductivity of 239Us, a temperature in the early morning of 25°C and a pH almost neutral at 7.42 due to the high sediment composition mentioned previously. Some of the fish we photographed with common names shown in parentheses. Head detail of Raphiodon vulpinus. Gymnogeophagus australis adult. Buy Blade and Soul Gold Foto Muela. Other inhabitants: Beyond the fish species displayed there are some that are now known to be extinct in this biotope and others that are invasive, negatively affecting the whole balance of the region. Some species of animals in danger in the wetlands of the Paraná Delta: (Quintana et al. 2002, IUCN 2007, Cappato & Yanoski 2009, Bó et al. 2010, DFS-SAyDS 2010, taller Ecologista 2010, Guzmán & Raffo 2011, among others) Blastocerus dichotomus: Endangered Category I – CITES convention Sporophila palustris: Endangered Sporophila cinnamomea: Sporophila hypochroma: Culicivora caudacuta: Sporophila ruficollis : Vulnerable Sporophila hypoxantha: Polystictus pectoralis: Spartonoica maluroides: Asthenes hudsoni : Amblyramphus holocericeus: Coturnicops notatus: Data Deficient Xolmis dominicanus: Endangered Leopardus geoffroyi: Potentially Vulnerable, Category I – CITES convention Lontra longicaudis: Endangered & Category I – CITES convention Anisolepis undulatus: Chthonerpeton indistinctum : Vulnerable Argenteohyla siemersi: Data Deficient Leopardus geoffroyi :Gato montés Riesgo bajo, potencialmente vulnerable, categoría I de la Convención de CITES Hydrochoerus hydrochaeris: Carpincho Riesgo bajo, potencialmente vulnerable Elachistocleis bicolor: Sapito narigudo Datos insuficientes Leposternon microcephalum: Víbora de dos cabezas Distribución restringida Coturnicops notatus: Phragmites australis River cane / reed used in experimental works for sewage treatment – Invasive (Goveto et al. 2008) Fish Species: Brycon orbygnianum Vulnerable Zungaro jahu Manguruyú Piaractus mesopotamicus Pacú Invasive Species Rattus rattus Black Rat Rattus novergicus Brown Rat Mus domesticus Domestic Mouse Cyprinus carpio Carp Protected Areas of this Region: There are four protected areas in this region, these are: La Reserva Natural Integral, an area of about 1500 hectares, la Reserva de uso Múltiple “Isla Botija”, which has about 759 hectares, La Reserva Natural de Objetivo Definido “Isla Martín García”, which has 180 hectares and is also an important bird reserve called AICA BA06, the natural reserve for fish species, la Reserva Natural Íctica “Río Barca Grande”. The municipal domain is also internationally recognised as a Biosphere Reserve, the “Delta del Parana” sector in the island municipality of San Fernando which holds an area of 78030 hectares and there is also a private reserve known as Bajos del Temor which is owned by the Wildlife Reserve Foundation Argentina. While these reserves seem to protect the site, many controls are not strict and often different sectors are affected by poor protection of them having no or insufficient control, this can be seen for example in la Reserva de uso Múltiple “Isla Botija” where urban development work has been allowed to take place. Gymnogeophagus balzanii, a young couple. In the upper right corner the female is guarding her offspring, previously she had camouflaged their eggs with sand, covering them so they were almost invisible. Ancistrus sp. A couple about to eat. In the upper right corner with newly hatched fry showing large yolk sacs and in the other corner a youth of about three months of age. Acknowledgements To my family for putting up with this crazy fish life at home. My expedition partner Alfredo Enrique Rodríguez Soler A Perico for covering in the office. asics france Bibliography: Menni Carlos Roberto; “Peces y Ambientes en la Argentina continental” , Monografías del Museo Argentino de Ciencias Naturales. March 2004. Rosso Juan José; “Peces Pampeanos guía y ecología”. L.O.L.A. 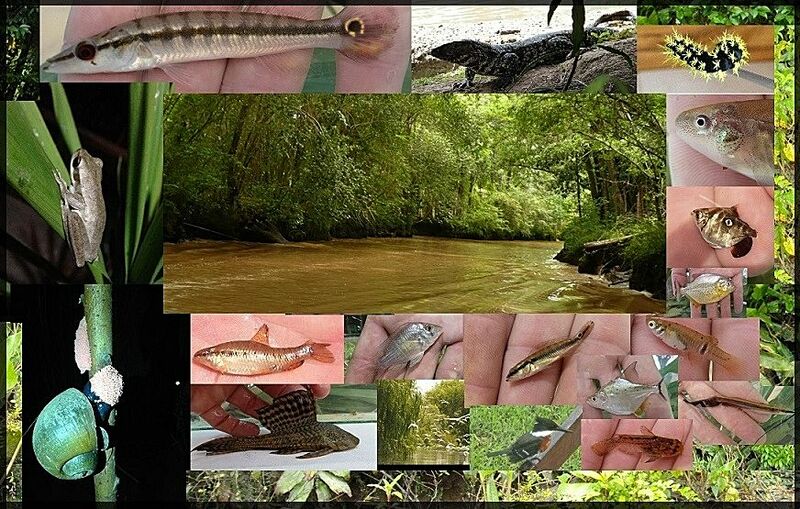 Almirón Adriana, Casciotta Jorge, Ciotek Liliana, Giorgis Pablo; “ Guía de los Peces del Parque Nacional Pre-Delta” Benzaquén Laura, Blanco Daniel E., Bó Riberto, Kandus Patricia, Lingua Guillermo, Minotti Priscilla, Quintana Rubén, Sverlij Sara, Vidal Laura; “Sistemas de paisajes de humedales del Corredor Fluvial Paraná-Paraguay” 2013. Laita Hernán, Aparicio Gustavo; “100 Peces Argentinos” Reichert Lang Juan José; “Atlas Ilustrado de los peces de agua dulce del Uruguay”. muy bonito y muy interesante. Creo que de nuevo en Argentina necesite más tiempo. Question, how does the substrate looks like in these habitats? Does it contains only sandbottom, or also small rocks? What kind of Macrophytes can be found in this biotope other than river cane/reed?